To all of you, dear readers and music fanatics, we wish you a wonderful 2014, full of new sounds, new listening experiences, and art as art was meant to be, to offer new perspectives, to replace the current modes of sensing, to move, to disturb, to change, to impact, to express, to share, to destroy, to create. 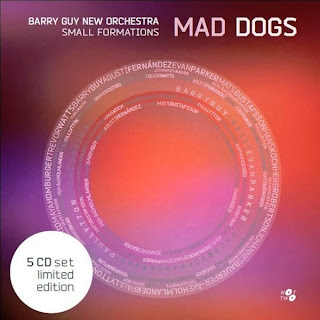 Your vote was cast for the most innovative listening experience of 2013, and the winner is Barry Guy's Mad Dogs. 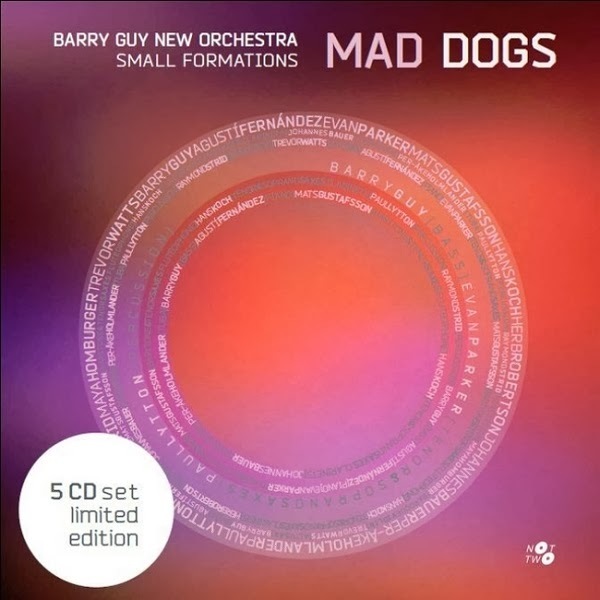 Congratulations to Barry Guy and his small formations, consisting of Agustí Fernández, Mats Gustafsson, Johannes Bauer, Per-Åke Holmlander, Hans Koch, Evan Parker, Paul Lytton, Trevor Watts, Raymond Strid, Maya Homburger and Herb Robertson. So congratulations again to all the bands and musicians who innovated our hearing this year, who created new listening experiences. 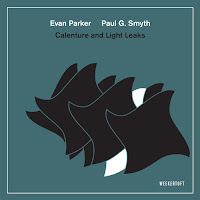 When it comes to modern (improvised) music, I associate "innovative", somehow intuitively, with high post-production and some kind of electroacoustic framework. 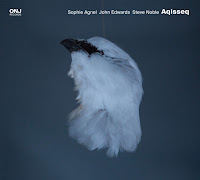 Something like Looper - Matter or Jeremiah Cymerman - Sky Burial (great albums). As if the traditional instruments (and the players) themselves weren't enough if one wanted to be in the vanguard. "This is not the world of microsound or the quiet smears of instruments and electronics that mark more recent branches of improvisation. This is the physical, acoustic collision of virtuosity and musical ingenuity, the raw synergy of musicians recognized as masters of the form. There’s an urgency spanning across these discs, as though Mad Dogs is making a case for the very legitimacy of free improvisation itself. " It's a very powerful thought, one I'll be keeping in mind while listening to new music in 2014 or indeed, while listening to music in general. Apart from the great title, I’m somewhat sceptical about the category of “innovative” album of the year and frankly, apart from the novel packaging, I’m not convinced that “Mad Dogs” is particularly innovative. But I’m not going to bang on that drum today – if I’d had to nominate a single album of the year (innovative or otherwise) “Mad Dogs” would have been it. For the reasons given so succinctly in the quote from Dan’s review, it shows how far improvisation has come and represents a benchmark of what can be achieved, Master musicians at the peak of their form. Thanks for the comments. We're all aware of the vagueness of the "innovative" concept, let alone to subject it to a vote, because that's actually contradictory ... you cannot expect the most innovative music to be heard by so many that it will come out as the number one in a Eurovision contest of improvised music. But then if you look at it pragmatically, it will point readers to music that will be challenging to their ears, and open op up some new experiences that they have been looking for. So, even if not theoretically sound, it may help in pushing boundaries. Stef, it’s not the vagueness of the concept of innovation, or subjecting it to a vote that troubles me: it’s simply that I’m doubtful that innovation is, in and of itself, a sufficiently important musical quality to merit an award, particularly when it’s the only thing for which readers can vote. Why not just have a vote on album of the year, which is what I suspect most had in mind when voting for “Mad Dogs” anyway? Why wouldn’t all the laudable things you mention be achieved by doing that? (although I’m more for musical substance than pushing boundaries, albeit that the two aren’t mutually exclusive). Paradoxically, I think the reviewers’ collective top album of the year – Matana Roberts - Coin Coin Chapter Two: Mississippi Moonchile – is probably more innovative than “Mad Dogs”, the readers’ most innovative listening experience of 2013. Hi Colin, that's the whole point : the most innovative is not necessarily the best or vice versa. I must agree that neither Mad Dogs nor Mississippi Moonchile figured in my list of most innovative albums. Okkyung Lee's Ghil or Common Objects or Kristoff K Roll & Daunik Lazro and Looper were. 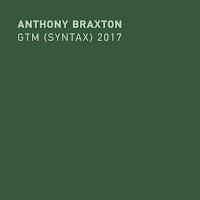 Innovative means opening new aural vistas, new sonic possibilities, maybe challenging at first, not sufficiently mature yet to be the "best" of the year, but adventurous enough to go where no man has gone before. Perhaps you should rename it the award for enterprise? I would go for Colin on this one, we had a similar discussion last year. I know that the price has established a certain tradition but - even if I do not know for sure - I guess most of the readers vote for the best album (I must admit that I also did that before I started writing here). :-). Anyways, there's nothing wrong with this album - it is a great one. What I was wondering - but don't get me wrong here, I don't want to spoil anything - is the fact that it somehow got 100 votes from one day to the other ;-). I am looking forward to another year of great releases. 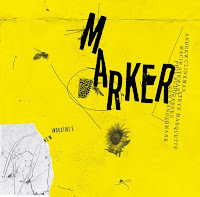 Who is Ken Vandermark? DKV Trio or Resonance? meilleurs voeux et bonne continuation à ce blog engagé et passionnant. When I think of innovative, I break it into the three elements of music - rhythm, melody & harmony - and look for something special in at least two of the three building blocks. I look at which established structures in music are being broken and redefined and how well this is done. 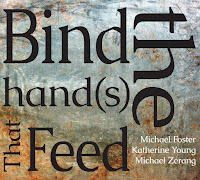 there the authors have also defined the concepts of gesture and space. i agree with stef's "opening new aural vistas" concept but this should be put into some sort perspective otherwise innovation is a game of whoever makes the strangest noises with the trumpet.